Sociology 6Z03 is an introductory social-statistics course. The principal goal of the course is to introduce students to the fundamentals of statistical reasoning and to the role of statistical methods in social research. At the end of the course you should be able to read sociological research that uses basic statistical methods; to undertake elementary data analysis; and to take more advanced courses in social statistics -- in particular, Sociology 740. Although Sociology 6Z3 may be taken as a review, it is intended to be intelligible to students who have no preparation in statistics. 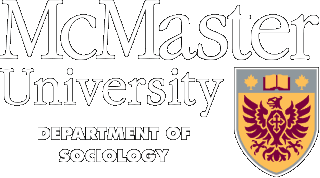 Enrolment is limited with priority given to students in the Department of Sociology. Permission of the instructor is required for non-Sociology graduate students. Non-Sociology students should attend the first day of the class. If academic background and space permits, a waiver form will be completed by the instructor which will permit non-Sociology students to register on Solar.